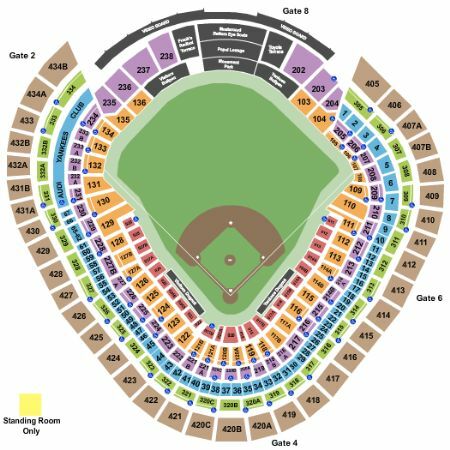 New York Yankees vs. Toronto Blue Jays Tickets - 7/12/2019 - Yankee Stadium in Bronx at Stub.com! Does not include admission to event. Tickets will be ready for delivery by Jul 08, 2019. Tickets will be ready for delivery by Jul 10, 2019. Mobile Entry Tickets. Must have smart device on hand to enter event. Tickets will be ready for delivery by Jul 08, 2019. Tickets will be ready for delivery by Jul 05, 2019. Tickets will be ready for delivery by Jul 09, 2019. Mobile Entry Tickets. Must have smart device on hand to enter event. Do not print these tickets. Tickets will be ready for delivery by Jul 10, 2019. Mobile Entry Tickets. Must have smart device on hand to enter event. Do not print these tickets. Tickets will be ready for delivery by Jul 11, 2019. Mobile Entry Tickets. Must have smart device on hand to enter event. Tickets will be ready for delivery by Jul 10, 2019. Includes access to Audi Yankees Club & Pepsi Lounge. Mobile Entry Tickets. Must have smart device on hand to enter event. Do not print these tickets. Tickets will be ready for delivery by Jul 10, 2019. Mobile Entry Tickets. Must have smart device on hand to enter event. Do not print these tickets. Tickets will be ready for delivery by Jul 08, 2019. Second row in this section. Tickets will be ready for delivery by Jul 11, 2019. ADA accessible these tickets allow for wheelchair access if needed. Chairs are provided for non-wheelchair customers. Tickets will be ready for delivery by Jul 08, 2019. Includes access to Audi Yankees Club & Pepsi Lounge. Tickets will be ready for delivery by Jul 08, 2019. Tickets will be ready for delivery by Jul 08, 2019. Tickets will be ready for delivery by Jul 11, 2019. These seats are on the aisle with purchase of the entire group. Tickets will be ready for delivery by Jul 10, 2019. ADA accessible these tickets allow for wheelchair access. Tickets will be ready for delivery by Jul 09, 2019. Join The Tailgators Exclusive Tailgate for a 3+ hour tailgate party before the game up to game start time. All-U-Can-Eat and Drink. Tons of food including, Steak, Chicken, Meat Balls, Pork, Pasta, Sausage & Peppers, Bratwurst, Hero Sandwiches, etc.. As well as Hamburgers, Hot Dogs, Stromboli and NY Pretzels! DJ Dave takes your requests and gives you a chance to win his 50/50! Location 153 & Yankee Stadium Metro North Stop. All sales are final. Tickets to the game or parking passes not included in this package. This is a tailgate only! Mobile Entry Tickets. Must have smart device on hand to enter event. Tickets will be ready for delivery by Jul 05, 2019. Mobile Entry Tickets. Must have smart device on hand to enter event. Do not print these tickets. Tickets will be ready for delivery by Jun 22, 2019. These seats are on the aisle with purchase of the entire group. Tickets will be ready for delivery by Jul 09, 2019. Mobile Entry Tickets. Must have smart device on hand to enter event. Do not print these tickets. Tickets will be ready for delivery by Jul 12, 2019. Mobile Entry Tickets. Must have smart device on hand to enter event. Do not print these tickets. Aisle seats. Tickets will be ready for delivery by Jul 12, 2019. Third row in this section. Tickets will be ready for delivery by Jul 10, 2019. Mobile Entry Tickets. Must have smart device on hand to enter event. Do not print these tickets. Tickets will be ready for delivery by Jul 07, 2019. Mobile Entry Tickets. Must have smart device on hand to enter event. Do not print these tickets. Access to Jim Beam Suite Club. Tickets will be ready for delivery by Jul 11, 2019. Includes access to Audi Yankees Club & Pepsi Lounge. Tickets will be ready for delivery by Jul 05, 2019. Access to Jim Beam Suite Club. Tickets will be ready for delivery by Jul 08, 2019. ADA accessible these tickets allow for wheelchair access. Mobile Entry Tickets. Must have smart device on hand to enter event. Do not print these tickets. Tickets will be ready for delivery by Jul 11, 2019. Mobile Entry Tickets. Must have smart device on hand to enter event. Do not print these tickets. Includes access to MVP Club Lounge. Tickets will be ready for delivery by Jul 11, 2019.